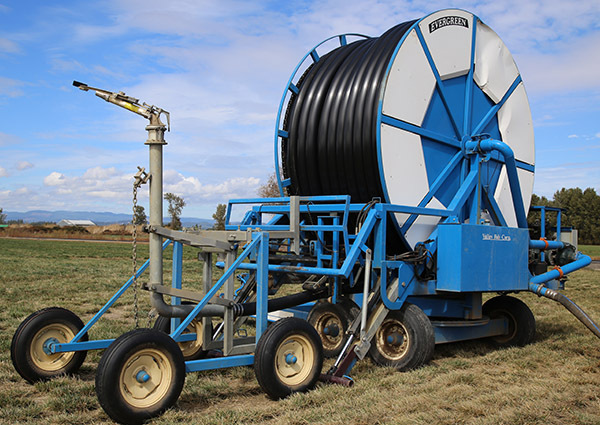 An often asked question is whether there is a benefit to application of irrigation in late summer or early fall (mid-August until the end of September) in grass seed crops such as perennial ryegrass and tall fescue in the Willamette Valley. Our research and extension team in seed crops conducted studies over a broad range of years to determine whether irrigation in this period is helpful for these seed crops. Some of our perennial ryegrass work was done in the very dry years of the early 1990s. Those years were as dry as our recent multi-year drought in western Oregon. What we found was that in two cultivars of perennial ryegrass, there was no effect of 2 inches of irrigation water in August and September on seed yield over a three-year period. The late summer and early fall period has long been thought to be critical for regrowth of the grass seed crops after harvest and for the following year’s seed yield. Extremely dry conditions during this period in the Willamette Valley can reduce stands and crop regrowth in both seed crops. There is good evidence from our research that irrigation does improve the appearance of the stand (number of tillers and stand cover) going into the winter. In a second set of trials, post-harvest irrigation was applied (5 inches) in three years in perennial ryegrass and in tall fescue from 2010 through 2012. This was compared with no irrigation. Weather conditions ranged from very dry to very wet in fall in the study years. Our results clearly indicate that there was no effect of this irrigation on seed yield in perennial ryegrass and tall fescue. Our investigations suggest that while early fall irrigation increases tiller production and may enhance stand persistence under Willamette Valley conditions, there were no beneficial effects of fall irrigation on seed yield in perennial ryegrass and tall fescue even under dry conditions. The soil at our Hyslop Farm research site is a medium textured soil (Woodburn silt loam) that is typical of many places in the valley where tall fescue and perennial ryegrass seed crops are grown. This soil is deep and has good water holding capacity. So what about other soils? If tall fescue or perennial ryegrass is grown on a light textured soil with poorer water holding capacity and high drainage such as soils that have high sand content and low clay content, then we cannot rule out the possibility that irrigation might be beneficial for stand persistence especially in areas that have gravel bars. But it is not known whether irrigation in these soils is beneficial for seed yield. Posted in Grass Seed Crops, Irrigation, Perennial ryegrass, Seed Production, Tall fescue.